AJ Hackett Giant Jungle Swing is a quick way to travel through the dense tropical rainforest and the mountains of Cairns. Along the way, you will be immersed within the trees and natural waterfall flowing into the pond onsite at the lush oasis. This is perfect way to kick back and relax after getting your thrills jumping from the tower. But it won't be the Swing Master which will set you off on your jump - it will be you who pulls the self release. So when you're ready, take the plunge! Go from zero to quick with the AJ Hackett Giant Jungle Swing! SAFE. The Jungle Swing has been operating for over 10 years and has been designed to make sure at all times there are a minimum of 2 independent points of attachment. What speeds do you travel at? There is the potential to reach speeds of up to 120kph in 3.5 seconds. This Swing really gets you flying. Can I swing with a friend? Yep, and we encourage you to swing with 1 or 2 friends (3 in total) and the more combined weight you have, the faster you fly. 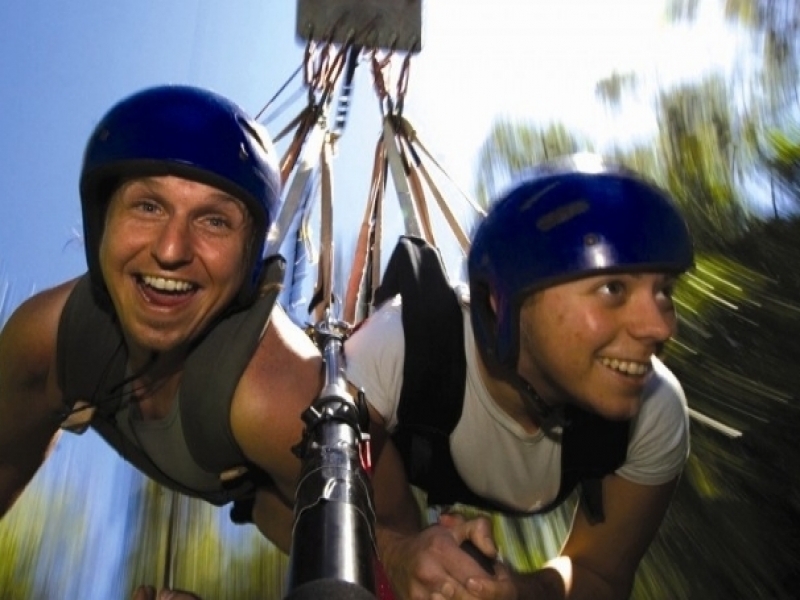 Swingers are fitted into hang-gliding style harnesses and lie horizontally. They are winched up to the release point, where once instructed to do so, you pull a quick-release cord and soar through the rainforest. The Swing is complete once returned to the initial starting point. Can you swing and bungy in one day? Of course you can. As they're both located at our Cairns site it's a rarity for people to not do them both in one day. Is there any restrictions to swing? Only a few restrictions apply to the Swing - of course if you have any medical condition you are concerned about - call us and have a chat with one of our crew - always happy to answer your questions. There aren't many restrictions - we can swing people in wheelchairs, with limited or no eyesight and many other cases - just call us to discuss further.